Nowadays many people prefer traveling to Ladakh using public transport and bus services are most famous among budget travelers. So, the questions like “Can I reach Ladakh using Srinagar to Leh bus service?” are not surprising. Traveling by bus to Ladakh using Srinagar to Leh bus is an experience in itself. The budget travelers love traveling in this manner as they not only feel it saves money but they also live a different kind of experience in a local way. So, you save cost as well as gain memorable memories. No doubt, this method of using public transport, that is bus services, is very common among solo travelers in Ladakh. Why do you need to use Srinagar to Leh Bus Service? We all know that the personal taxis within Ladakh are very costly. If you want to travel from Srinagar to Leh in a private taxi, it will easily cost about Rs 16000-17000. If you are traveling from Delhi to Jammu to Srinagar then include the cost of travel between Delhi – Jammu – Srinagar too. So, the overall taxi cost from Delhi to Srinagar to Leh will cost you about Rs 30000 – 33000. Taxis within Ladakh leaves a big dent in your pocket. If you are traveling solo or as a small group, it almost becomes unaffordable to travel in a private taxi. A budget trip to Ladakh using a private taxi is not a possibility in Ladakh. Hence, people on a low budget need to find alternate ways to travel to Leh from Srinagar without leaving their pockets empty. So, what are your options for sightseeing on Srinagar Leh Highway and reach Leh from Srinagar but do all of it as a pocket-friendly trip? Thankfully, as so many people visit Ladakh in the season time, the roads are filled with tourists even in Jammu and Srinagar in season time. You may find travel partners in Srinagar, near bus stand or Dal Lake taxi stand where people look out for others to share taxi cost of Srinagar to Leh trip. However, if you want to make a trip to Leh from Srinagar, you will have to spend Rs 16000 – Rs 18000 for the private taxi. Even if you get five people to share the cost of this private taxi to Leh from Srinagar, it means you have to spend Rs about Rs 3200 – 3600 each for a two day trip to Srinagar to Leh in a private taxi. Planning to take Srinagar to Leh Bus Service? Some people travel with an open mind and prefer traveling on a budget over the comfort & luxury. Spending Rs 2000-3000 just for transport to one place in Ladakh could be a decent portion of your complete budget of a trip to Ladakh. So, let me share the details with you about the bus service that runs between Leh and Srinagar including the bus schedule, timings, and the bus ticket fare. Wait, before we understand public transport buses from Srinagar to Leh, let us first understand what places of sightseeing exist on Srinagar Leh Highway. It will help you then understand how you can plan the trip to Leh from Srinagar and which buses options should you be choosing. The Srinagar Leh bus route runs through many nice villages on the way to Leh from Srinagar. 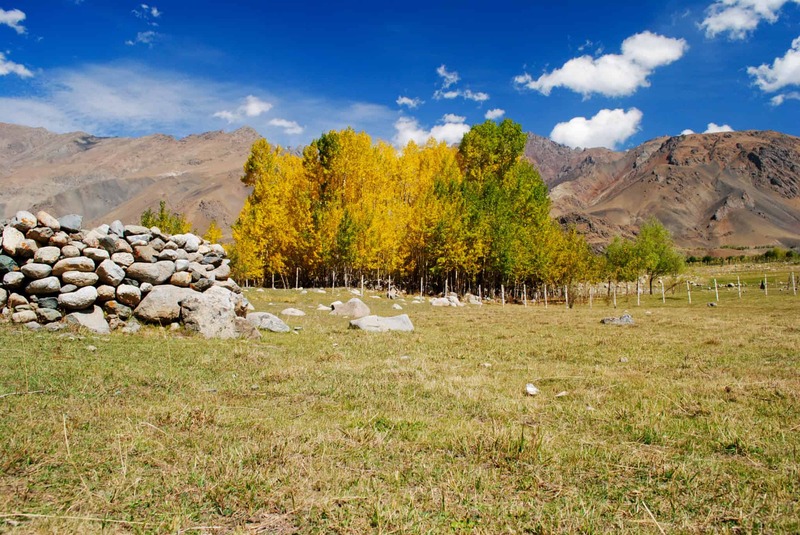 You pass through Sonamarg to cross over the dreaded Zojila Pass and enter the Drass – Kargil region. The meadows in Minamarg as you descend from Zojila are an absolute beauty. Then comes Drass meandering through some beautiful vistas as you further continue to Kargil War Memorial and reach Kargil. The quaint little busy town of Kargil, in itself, is a beautiful place. Some of the Srinagar to Leh bus services stops overnight at Kargil. 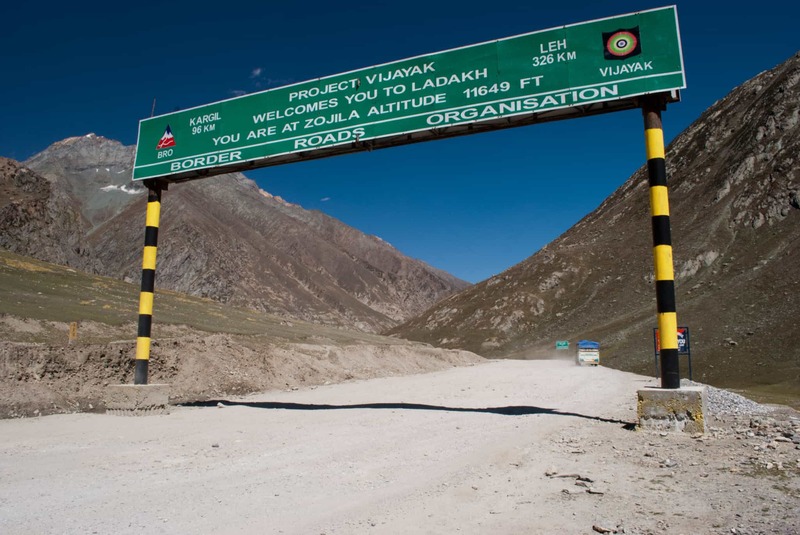 Once you cross Kargil, you reach Mulbekh having the Maitreya statue and further continuing the journey you cross over the Namkee La Pass and Fotu La pass to reach the Moonland called Lamayuru. Most people have a meal at Lamayuru. 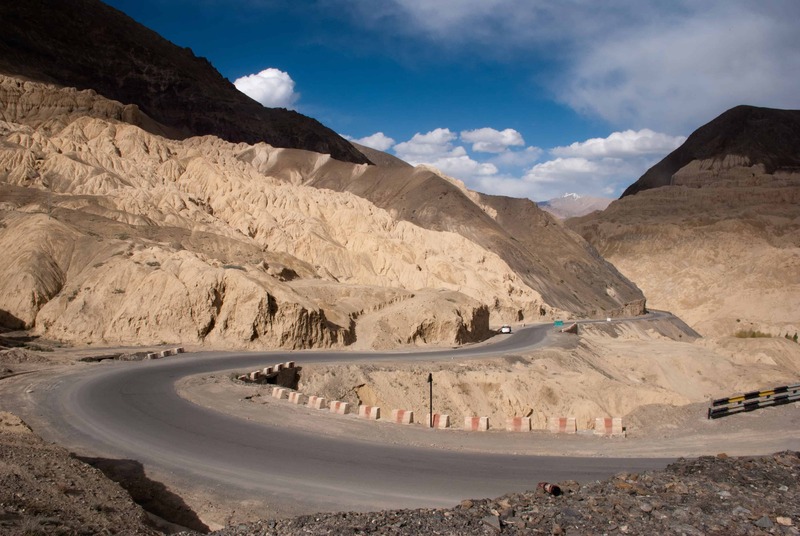 After Lamayuru, the views of the Indus valley are wonderful and finally, you traverse through Sham Valley to reach Leh. Sham Valley sightseeing include Alchi, Likir, Basgo Palace, Magnetic Hills, Confluence at Nimmu, Gurudwara Pather Sahib. 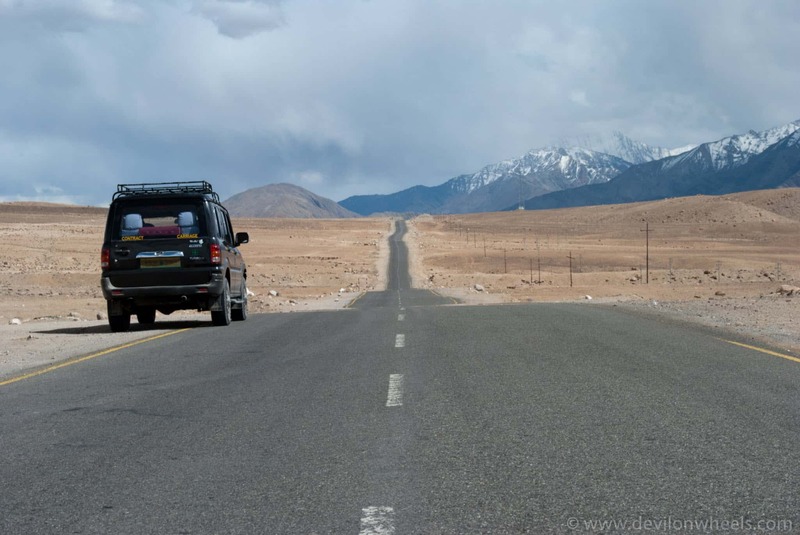 So, you can see that there is quite a bit of sightseeing which is present on a journey from Srinagar to Leh. Knowing about them will help you choose from the options of Srinagar to Leh bus services run by JKSRTC and private operators. Now that we know what is present on Srinagar Leh Highway. Let me start with the details on bus services on Srinagar Leh route along with the schedule and timing of the buses running from Srinagar to Leh. There are quite a few bus services available on Srinagar to Leh route. The govt. run JKSRTC department runs buses between Srinagar and Leh. Many private bus tour operators also run buses in the form of tempo travelers or semi deluxe mini-buses with cushion seats. So, you can travel from Srinagar to Leh using JKSRTC buses as well as private buses run by private operators. The difference between them is mostly pricing. Those of you who are interested in knowing, there is no Volvo bus service from Srinagar to Leh. So, super deluxe bus from JKSRTC is what you get as the best bus to travel from Srinagar to Leh or tempo travelers run by private tour operators for better comfort. The JKSRTC Srinagar to Leh bus service is available at TRC near Dal Lake in Srinagar. This bus covers the 434 KM long journey on Srinagar – Leh Highway in two days. The bus from Srinagar to Leh starts at 8 AM at present, halts at Kargil for one night. It leaves Kargil at around 7 AM in the morning and then reaches Leh the next day from Kargil by evening. If you plan to split the journey and does not want to take the direct bus from Srinagar to Leh, then you can take a JKSRTC standard bus to Kargil from Srinagar and then next morning take the bus running between Kargil and Leh. The super deluxe bus from Srinagar to Leh charges around Rs 1320 per person and semi deluxe bus fare is Rs 925 per person from Srinagar to Leh. If you prefer to travel by a standard bus from Srinagar to Leh, the bus fare is Rs 470. The standard bus fare from Srinagar to Kargil is around Rs 250 and Rs 325 for a semi-deluxe bus. Similarly, the bus fare from Kargil to Leh is also around Rs 350. If you are starting from the other side, then the bus from Leh to Srinagar starts in the afternoon at 2.00 PM. This JKSRTC bus nonstop over the night and arrive at 7.30 AM in Srinagar. You miss all the sightseeing over Srinagar Leh Highway as you will be traveling at night. However, this bus helps you save a day in your overall trip plan. The bus fare of Leh to Srinagar deluxe bus is about Rs 1058 per person, the semi-deluxe bus between Leh – Srinagar charges Rs 670 per person and the standard JKSRTC buses charge around Rs 470 per person for Leh to Srinagar bus journey. The private bus operators that run Leh to Srinagar bus services charges about Rs 1200-1500 per person based on the type of bus or a tempo traveler you opt. These privately run tempo travelers and mini-buses run overnight from Leh to Srinagar. They start from Leh town every day around 5.30 PM – 6.00 PM, run non-stop overnight and reach Srinagar next day in the morning around 7.30 AM – 8.00 AM. These Mini-buses are best options available for public transport on Srinagar Leh Highway. You get individual cushion seats and some level of comfort to sleep at night on these buses. Please note that the bus timing between Srinagar – Leh route is also dependent on the timings of Zojila pass in the early season. The roads are narrow at Zojila Pass in the months of April and May, so, army allows one-way traffic to ply between Kargil and Sonamarg. It is best that you get your tickets for Srinagar to Leh bus service from the bus stand one evening day in advance. You will have to go in person to the ticket counter at Leh or Srinagar to get your tickets. It is strongly recommended that you do not rely on reaching there in the morning and buy the ticket as you may end up not getting the tickets. Unlike Manali – Leh bus services, the JKSRTC Srinagar Leh bus booking cannot be booked online and you will have to purchase the bus ticket from the ticket counter at the bus stand in Leh or in Srinagar. You should note that there is no direct bus service from Jammu to Leh. First, you will have to reach Srinagar from Jammu by bus and then from Srinagar, you can get the options to travel from Srinagar to Leh by bus. Recently in 2018, JKSRTC department started the direct bus service between Jammu and Kargil. So, you can also take the direct bus to Kargil from Jammu and then from Kargil take the bus to Leh. Similarly, if you are coming from Leh to Jammu, there is no direct bus service running between Leh and Jammu. You will have to reach Srinagar first from Leh and then from Srinagar take the bus to Jammu. Or you can also reach Kargil and then take Kargil to Jammu direct bus service. The bus from Jammu to Srinagar leaves at 7 AM in the morning from JKSRTC counter which is located just across the TRC, Residency Road. This is 10 seater non-AC minibus which is termed as super luxury coaches. So, do not get too confused when boarding them or looking for them at Jammu bus stand. The bus from Srinagar also leaves at 7 AM for Jammu just beside the TRC and it reaches Jammu by late evening. The Jammu to Srinagar bus journey takes about 10-11 hrs to complete depending upon the traffic situation and any roadblocks on the way including the Jawahar tunnel. The super deluxe bus fare for Jammu to Srinagar bus service is Rs 445 per person, the deluxe bus service costs Rs 325 and standard JKSRTC bus from Jammu to Srinagar costs Rs 220. If you are traveling by bus from Jammu to Srinagar and want to spend the previous night in Jammu, I will suggest that you stay at the hotels near Residency Road. The auto-rickshaws will take about Rs 70-80 to take you to the TRC or JKSRTC counter in the morning. It is highly recommended that you reach early in the morning (by 6.15 AM) at the bus stand in case you do not get bus tickets in advance the previous evening. Sometimes, the person at the ticket counter will not give you the tickets an evening before. This is more common at Srinagar while in Jammu mostly the Jammu Srinagar bus tickets are issued one night in advance. Hence, do not take the chance of reaching on time to get the ticket for Srinagar Jammu bus service, in case you do not have the ticket. The online bus ticket booking of Jammu Srinagar bus service is not available as of now. So, you have to buy the bus ticket in person at the ticket counter. You can always refer the complete Leh Ladakh bus schedule to read about all the buses that operate in Ladakh region. Let us look at some of the most frequently asked questions about Srinagar to Leh bus services. 1. Is there any other way to travel to Leh from Srinagar if I miss the bus? There are plenty of buses or travel options that run between Srinagar and Kargil. If you miss the bus from Srinagar to Leh, you can always reach Kargil from Srinagar either by other buses or shared local jeeps. 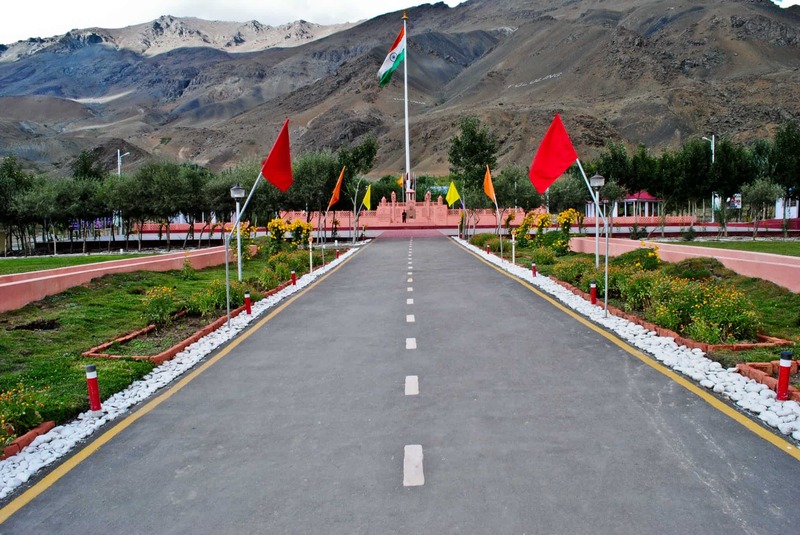 Once, you reach Kargil, you can take the next morning bus from Kargil bus stand or shared local jeep from Kargil to Leh. Apart from the JKSRTC buses, private tour operators also run buses between Srinagar to Leh. 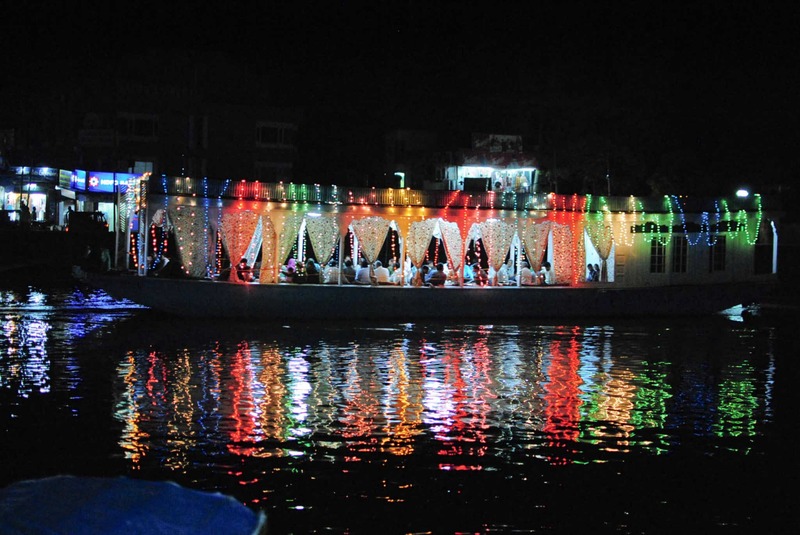 Finally, you can also look out around Dal Lake for other tourists to share private taxi costs. If nothing works, hitchhiking on Srinagar Leh Highway will be your last option. 3. Can I do pre-bookings for Srinagar to Leh bus service? You can walk over to the ticket counter at Srinagar or Leh an evening in advance and busy the bus tickets for the next morning. Leh to Srinagar bus can be purchased in the morning in Leh. Similarly, Jammu to Srinagar bus service bookings can be done a day in advance. But at times the counter guy does not give the tickets, so go early in the morning. 4. Is it possible to book the Srinagar – Leh – Srinagar bus online? Unfortunately, there is no online bus booking available for Srinagar to Leh bus services. Even for Jammu to Leh bus services, there is no online booking available. 5. Is the journey on a Srinagar to Leh bus comfortable? The JKSRTC buses run both deluxe, semi-deluxe and standard buses while local travel agents run tempo travelers. The journey in deluxe buses are much comfortable with cushion seats but they are not Volvos for sleeping comfort. Do not expect much luxury from the standard buses as they are regular transport bus services. Some local travel agents do run tempo travelers but then you are looking for shared tourist taxis or tempo travelers which costs higher than these standard buses. So, the comfort will come at some cost but I think the deluxe or semi-deluxe buses are still decent bet apart from tempo traveler to travel from Srinagar to Leh by bus. 6. Do these buses from Srinagar to Leh stop for any sightseeing on the route? 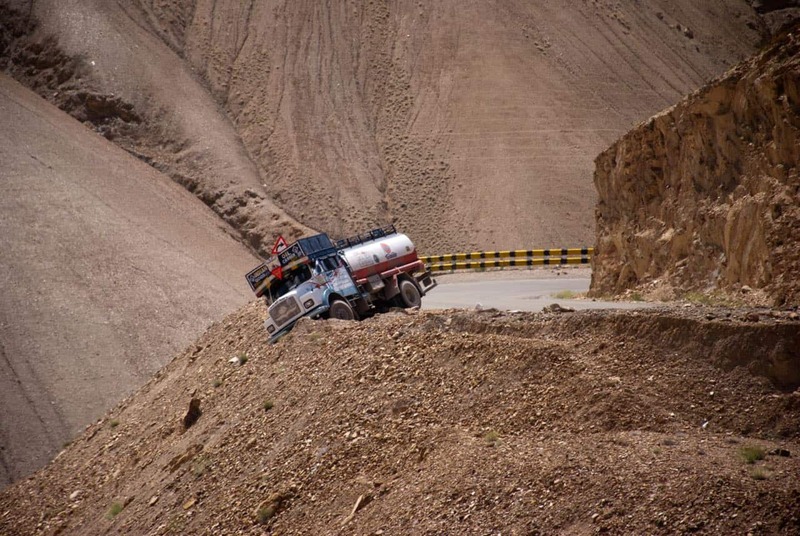 The buses running between Srinagar and Leh do not stop for any sightseeing on Srinagar – Leh Highway. These are local standard buses which locals use as well and budget travelers mostly use them. These are not tourist buses that stop for sightseeing. Unlike HPTDC, the tourism department of Jammu & Kashmir does not offer any dedicated tourist bus services on Srinagar to Leh route. Please note that the standard buses may not even stop briefly at high mountain passes like Zojila, Fotu La, Namkee La on Srinagar Leh Highway. So, make use of every opportunity to click pictures when the bus stops for meal breaks over Srinagar Leh Highway. All keep taking photos as you travel on the bus by taking on the right-hand side when traveling from Srinagar to Leh. I hope this article will help you learn about the bus services from Srinagar to Leh and vice-versa. Also, I have covered the bus services running from Jammu to Leh via Srinagar in this article itself to keep all the info under one hood. I have covered the most important FAQs towards the end but if you still have got any questions on making a trip to Leh from Srinagar by public transport, please feel free to post those questions in the comments section. Have you traveled on the Srinagar to Leh bus on your trip to Ladakh? I will be happy to hear about your experience in the comments section of the article. If you know your friends or family are planning a trip to Ladakh, do share this article with them to help them make a memorable Ladakh trip.